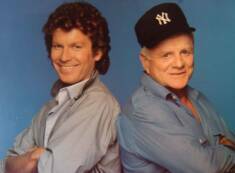 Welcome to the virtual season of Hardcastle and McCormick, where devoted fans explore what could've, would've, should've happened to our heroes had "Chip Off the Old Milt" been simply a season finale, rather than closing out the series. So, after a 25 year hiatus, we're proud to present the stories that might have been told. We hope they continue the tradition of this classic buddy show, and we hope you enjoy them. We're glad you dropped by, and if you have any comments or questions about the virtual episodes, the show in general, or just about anything Hardcastle and McCormick related, please do sign the guest book and let us know what you think. Also, because we want everyone to be able to enjoy all aspects of Hardcastle and McCormick, we've included links to Gulls Way, a Yahoo! group where you can mingle with other fans, and the Playground, where you can find a collection of visual arts created by fans. Do browse around and see what there is to see; we think you'll be glad you did. Lastly, this is a labor of love, created by fans for fans. We mean no disrespect to the original creators of this show, nor do we intend to infringe upon their rights in any way. The common bond of Hardcastle and McCormick has allowed us to make some dear friends through the years, and the only profit we hope to earn from this endeavor is the chance to make even more.